Akron Beacon Journal – August 8, 2018 – Cuyahoga Falls, Ohio – The brand new Woodridge Elementary School is a natural fit in the most literal sense. 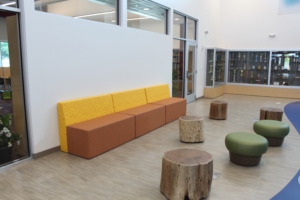 Located right outside the boundaries of the Cuyahoga Valley National Park and feet away from the district’s two existing schools, the new building incorporates elements of its natural surroundings from floor to ceiling. Before the school opens its doors to students Aug. 15, the district is hosting a grand opening and ribbon cutting from 1 to 3 p.m. Saturday. 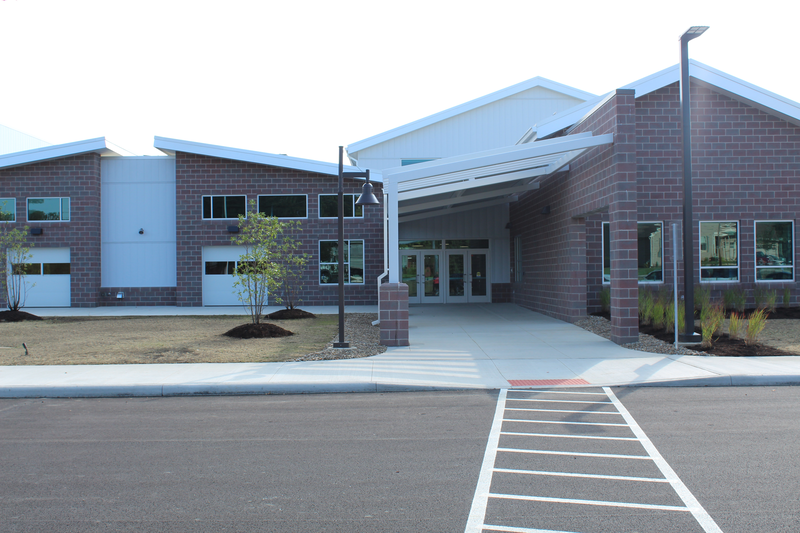 The new $28 million school, located at 4351 Quick Road in Cuyahoga Falls, was made possible by a bond issue passed in 2015, which also helped fund a new roof on the middle school and renovations to the high school. The school took 14 months to construct, along with months of preparation and meetings beforehand with community members and students to discuss what they’d like to see. Woodridge Superintendent Walter Davis said architects from Braun and Steidl Architects were looking for ways to honor the community in the building’s design—and they turned right down the road for inspiration. At the entrance of the school, blue tile reminiscent of the Cuyahoga River meanders through the hallway and flows into the commons area, which features a mural with a large tree and blue herons taking flight. There, a stage with a blue curtain and stone-like tile mimic the many waterfalls in the park. The river leads into academic wings, each of which feature murals of nature scenes that give them themes related to the park. The pre-K and kindergarten wing features the Cuyahoga Valley Scenic Railroad, with a large mural of its iconic yellow and red train. The third- and fourth-grade wing features murals of the Beaver Marsh boardwalk, while the first- and second-grade wing shows off the Towpath Trail. Even specialty rooms incorporate aspects of the community. The music room, for instance, features a mural of Blossom Music Center, located just minutes away from the school. “It’s easily recognizable by the young kids … And it really starts to make you feel this is a fun place as a student,” said Chas Schreckenberger, one of the project’s architects. The school replaces Woodridge Primary School in Cuyahoga Falls, which was for grades pre-K-2, and Woodridge Intermediate School in Peninsula, which was for grades 3-5. Both buildings turned 90 this year. Summit Christian School purchased the primary school last year, while Heritage Classical Academy will use the intermediate school as its new campus. Meanwhile, all 900 students from those two schools will combine into the new building this year, which is right next to the middle school and across the street from the high school up the road. “It was the board’s goal to make the school district all on one campus,” said Davis, citing advantages such as transportation savings and opportunities for programming that spans all grade levels. While incorporating naturalistic elements, project officials also wanted to give a small tribute to the old elementary buildings, too. One wing of the new building is called the Northampton Wing in honor of the primary school’s previous location on Northampton Road, while another wing is called the Boston Wing to honor the intermediate school’s previous location in the old Boston Township School House. The new elementary’ s unique features stretch beyond aesthetics. Davis envisions learning taking place in the hallways, which are equipped with white boards that kids can use to work in groups — even groups that cross grade levels. Welty Building Co. was the main contractor, while Regency Construction Co. served as the project manager. With a bulk of the money from the bond issue now spent, Davis said the district is looking into spending the rest on a new home for the transportation department, which is currently in a converted trailer with no restrooms. “That’s really the final piece of the puzzle,” Davis said.